Using Design Thinking to bring SAP Leonardo to life for Capgemini customers. How Capgemini adds value through Design Thinking to reduce pain in the customer journey. In this blog we will discuss how Capgemini are using Design Thinking to help our customers begin or expand their SAP Leonardo journey. This blog is part of the ongoing Capgemini SAP Leonardo series. “I want to do something different” or “How can I solve this impossible problem?” – these are two questions we hear many times from our customers, and as consultants we have always been problem solvers. However, over the last few years Capgemini has leveraged Design Thinking as a method to help with these questions and following the announcement of the joint Capgemini and SAP Fast Digital for Discrete Industries initiative, this approach has grown exponentially. One key element of Design Thinking (and how Capgemini use this with SAP Leonardo) is the identification of ‘Wicked problems’ and how to solve them. Wicked problems are those that are difficult to articulate in entirety, often have a lack of data/written documentation to help define them, and have multiple factors with often historical decisions that cause ongoing issues. The focus from Capgemini has been on the users and their journey through the process, as well as the end goal, rather than the actual technology or platform that will be used. This is often undertaken using tools such as delight graphs, user personas and user journeys to bring to life and highlight which parts of a process, or the tools involved, are causing pain for the users. Customer journeys are also a vital part of building a complete picture of an end-to-end process which involves customer interaction. By involving users and customers, engagement and ownership from multiple levels of an organisation, including external parties where required, is established. This in turn leads to a much deeper understanding of the problems, making it easier to establish solutions. 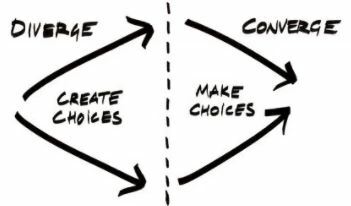 Design Thinking breeds new ways of looking at things; ideas are created through the Ideation process which includes a diverge phase (create choices/ideas) and converge phase (making choices) where we focus the challenge with the use of ‘How might we…?’ questions. Capgemini’s approach to using Design Thinking and SAP Leonardo is based on leading practice and experience gained from multiple digital transformation projects over the last few years. A key component of the Capgemini approach is the Digital Day. The Digital Day is a dedicated day (or days) for interested parties within the customer environment, with the help of Capgemini, to begin identifying pain points within the organisation, to discuss and ideate potential changes in strategies and to establish business value solutions using the SAP Leonardo processes and tools. These sessions include a Digital Readiness report and often a digital roadmap for the organisation is established during the sessions. Typically, the Capgemini team have already worked with a customer ahead of the Digital Day to identify the areas of the business to be addressed during the sessions. The customer representatives would then be presented with a goal that the business wants to achieve. Capgemini recently ran a Digital Day with a manufacturer who had the goal to ‘establish a omnichannel platform for customer and supplier communications’. The Digital Day established two things: a roadmap highlighting how the projects would achieve the goal, and that several further Design Thinking sessions were required to detail how the customers and suppliers used the current processes and the pain points associated with those processes. The objective of subsequent sessions would be to define potential solutions to identified issues and pain points with an emphasis on those that returned significant business value. By involving end users and customers, a complete journey through the system was established. From this, the technology enablers were determined and POCs created on the SAP Cloud Platform using business services from SAP Leonardo. For more information on how Capgemini are using Design Thinking and SAP Leonardo to exceed customer requirements and solve complex problems, please contact our SAP Leonardo experts.